This is one of our Unique Diamond Pendants that is a favorite. 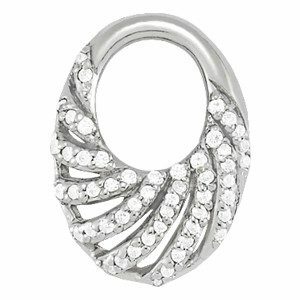 It is accented with swirled lines of 50, 1.1mm diamonds that will definitely draw eyes from around the room. This pendants is elegant and understated, yes stunning. ACCENTS: Around 1/3tcw. They can be Diamond, Gemstone, or CZ. The starting price is for one of these Unique Diamond Pendants in Gold with I1, HI color diamond. Contact us for other pricing. Click HERE to see another Diamond Pendants or contact us with your custom pendant idea.